Now that our gardens are actually giving off produce, I thought it would be fun to do a recipe using a vegetable that most of us are able to grow in our gardens. 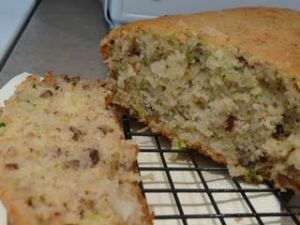 Today I bring you a twist on the traditional zucchini bread. It comes from the Real Moms Real Views site. We wanted to thank them again for hosting our giveaway last week. I will share the Hawaiian Zucchini bread, but they also have one for chocolate zucchini bread as well that you can check out.